Starting with this earlier post we have been discussing the construction of a stable visual field using techniques that use key-point matching and motion sensing. In both cases we attempt to map input from a three-dimensional scan onto an easily viewed two-dimensional surface. But any notion that we have a hi-def flat screen in our head or visual system is surely misguided. The world we live in is inherently a three dimensional space and we should be looking at how to properly represent a 3D world into a 3D data structure. Fortunately, this same problem came up in an earlier and completely different context. NASA launched satellites to study the cosmic microwave background (CMB) anisotropy (cosmic radiation in the universe) and needed software that met certain criteria for mapping radiation on a sphere. A software package was developed and open-sourced to the community. It’s called “HEALPix“, an acronym for Hierarchical Equal Area isoLatitude Pixelization. It’s the perfect solution for mapping our 3D visual field into a 3D representation. The software can be downloaded and compiled in the Pi Eye. We’ve done that and ran a scan storing the visual information into a HEALPix structure. 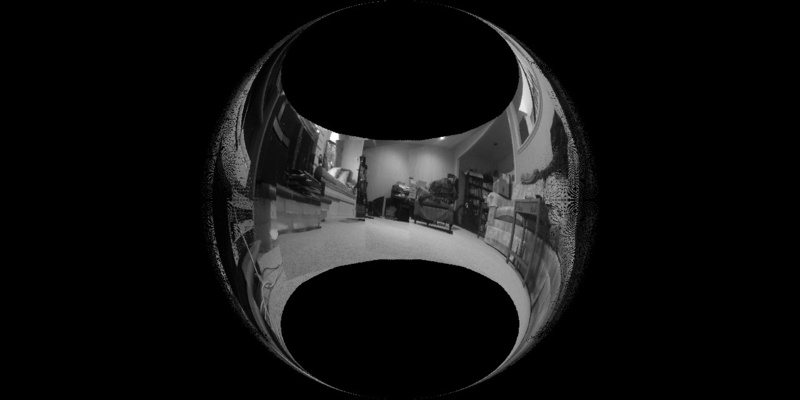 A visual field scan constructed using a Heal Plot algorithm. Once again we are faced with trying to show 3D information on a 2D surface. The HEALPix software allows you to do that, sort of, using what’s known as a Mollweide Projection. The above image shows the final results of this process.